Songwriter’s Beat is one of NYC’s premiere nights for performing songwriters, where each month artists are encouraged to perform their newest material in an intimate and supportive atmosphere. Valerie started Songwriter’s Beat in 2000 to support songwriters and encourage the creation of new songs. Songwriter’s Beat has presented over 350 songwriters from around the world, produced over 50 benefit concerts, seven annual festivals, dozens of songwriting workshops, a song contest and has fostered the creation of hundreds of new songs. Most importantly, Songwriter’s Beat has become a strong community of artists who support, inspire and encourage one another, often performing, recording and even writing together. Songwriter’s Beat has also sponsored themed songwriter events such as Political Songs of Change, Only Love Songs, Songs of Peace and EarthSongs. Since 2008, Songwriter’s Beat is honored to receive support from The ASCAP Foundation. 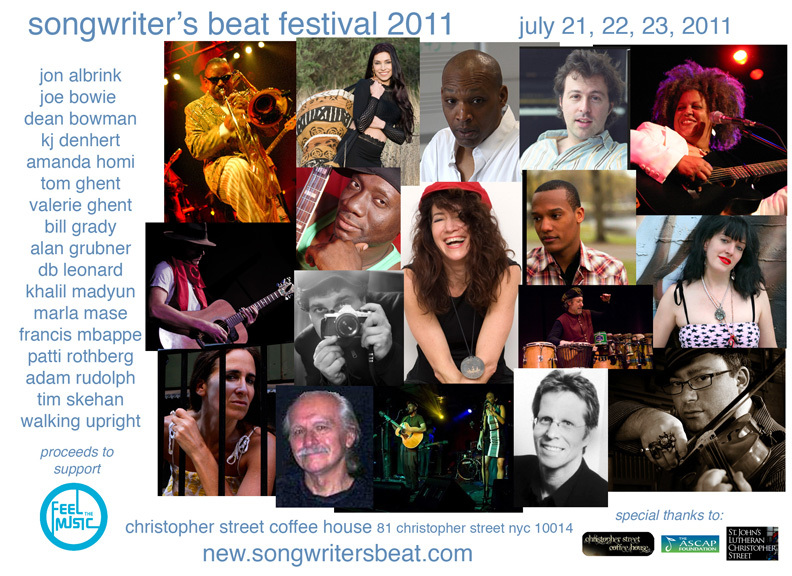 For upcoming events and to learn how to get involved, please visit songwritersbeat.com.